I’ve previously mentioned in my Chicco Next To Me Crib review that we have a newish baby (nine months now! 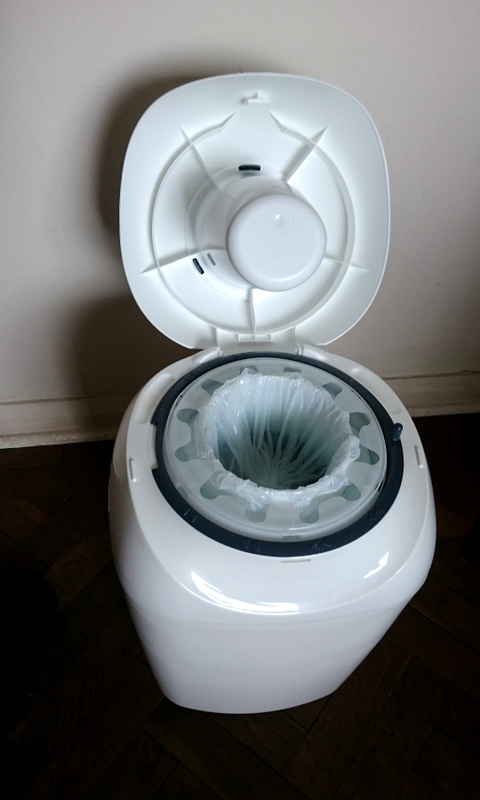 ), and this is how I stopped our house smelling like a toilet, with the Tommee Tippee Sangenic nappy bin. The Tommee Tippee Sangenic nappy bin when it is closed. The constant bane of having a small baby is how to dispose of nappies so they don’t stink up your house. We started with trying reusable nappies but my son’s legs are too slim to create a decent seal. We then moved to biodegradable ones as we were just putting them in the normal waste which goes to landfill. 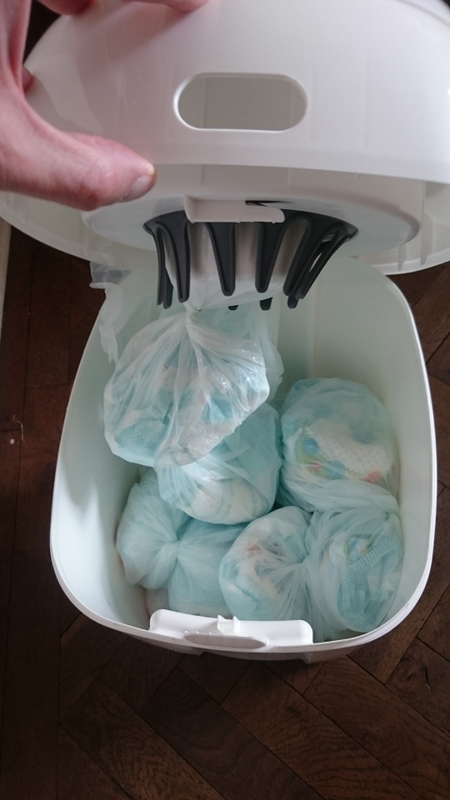 It turns out our local council has a specific nappy collection bag which they told me they incinerate, so we’ve since started using the normal disposable ones from Aldi (which are superb, incidentally). This then creates the problem that you have a bag containing baby poo sitting in your house for anything up to two weeks. This obviously stinks. We tried a container from IKEA but it just didn’t seal well enough, and going into the nursery was enough to make you retch. I mentioned this to a colleague at work and he said they use the Tommee Tippee Sangenic nappy bin and had no smell! This sounded too good to be true. A quick look on Amazon UK (Prime offer) and the reviews in general seemed rather positive, so ordered one straight away. Tommee Tippee Sangenic nappy bin when it is open. I have to say, the Sangenic has been a revelation! The basic idea is it seals after each nappy by manually twisting a long tube of antibacterial plastic film after you put the nappy into it. Totally ingenious, and it makes me wonder what the people who thought it was ineffective were doing wrong. It individually seals each nappy out the way as soon as it goes in, so it’s kind of difficult for it not to work if you use it correctly. 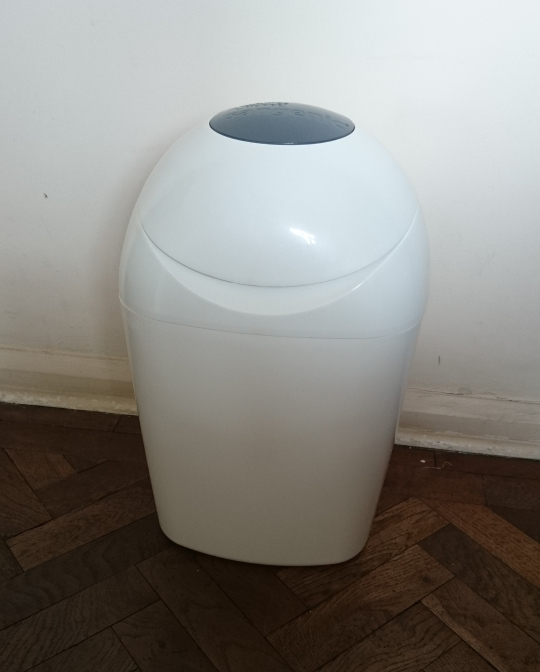 Before I got one, I thought to myself “I’m not spending ten quid on a BIN when I have a perfectly functional one already.” Now, I am a total convert. I really wish we’d bought this when he was born. Inside the Tommee Tippee Sangenic nappy bin, showing the individually wrapped nappies like a string of sausages. The refills aren’t too expensive (maybe a fiver each? ), and if you fold the nappy in on itself and seal it with the fasteners it means you can get more in the bin. I probably empty the bin every four days, and change the refill twice a month. Emptying is smell-free too, as they come out like a load of sausages (see above), ready to go straight into the council nappy waste bag. The empty refill cartridges can just go in normal recycling. If you want to stop your house smelling like absolutely disgusting, I can wholeheartedly recommend this bin. Do yourself a favour and pick one up now from Amazon UK. These links are affiliate links that earn me a few pence if you use them. It won’t make the product more expensive if you do, and I would be eternally grateful!